100 grains, Add collars and increase the weight to 150 grains. The SWAT A4 Broadhead is 4 blade 2" diameter force of devastation. The cut starts with the X-OUT tip, followed by the first 2 blades, which cut a 2" hole, on entry. As the A4 moves through the body the 2nd set of blades open causing massive damage and a huge exit wound of around 3" in diameter. The blades are incredibly strong. Forged from 420 SS it's near impossible to bend or break them. After rigorous testing and a few kills the blades still look new. The Swat A4 blades are razor sharp. SWAR A4 blades have no trouble bursting through flesh and bone. The A4 heads also stayed extremely sharp through over 30 shots. The pictures above are of a doe harvested with the A4. On the left you will see the entrance wound, on the right the exit. She made it around 15 steps before she bled out and died mid run. 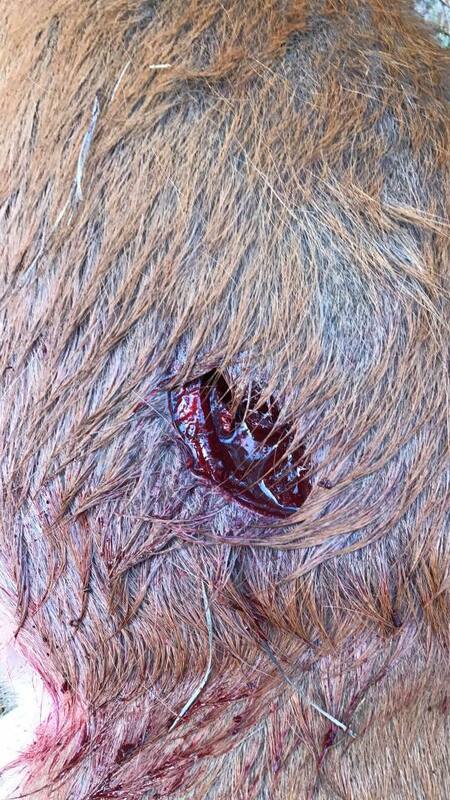 I have never seen a Broadhead produce this much of damage. The entrance wound is typical of most mechanical Broadheads, yet the exit wound looks like a baseball burst through the other side. The A4 uses a rubber band system that is easy to use. During our testing there were no premature blade openings or failures to expand in the target. They functioned properly and flawlessly. After slight adjustment to our bow we got around a 3" group out to 40 yards. The A4 fly true and hit the mark every time. The SWAT A4 has made us rethink the way we look at Broadheads. When you use this Broadhead you are firing mechanical genius. Any animal standing on the business end of the A4 won't run far.